A building dedicated to the murdered teenager Stephen Lawrence has officially opened in south-east London. 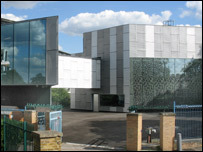 The Stephen Lawrence Centre, in Deptford, aims to inspire young people to pursue careers in architecture, the career path Stephen hoped to follow. Stephen, 18, was murdered at a bus-stop in Eltham, south-east London, in 1993. The centre, designed by award-winning architect David Adjaye, contains business development suites and digital audiovisual and design facilities. The centre, which was opened by the London mayor Ken Livingstone on Thursday, will help young people pursue careers in urban design and urban renewal. Karin Woodley, from the Stephen Lawrence Charitable Trust, said: "The Stephen Lawrence Centre will raise the expectations of young people, build their self-esteem and enable them to gain the skills and training they need to pursue rewarding careers in urban design and regeneration. "As urban designers of the future, they will be trained to envision, create and promote socially, environmentally and economically sustainable and inclusive communities - and to champion diversity and change." Meanwhile the centre's 'Youth, Creativity and Urban Design' curriculum, which targets young people aged from 14 to 25, offers academic and vocational programmes in partnership with leading firms and academic institutions. The centre has been funded by commercial and public-sector contributions. Although five men were arrested shortly after Stephen's death in April 1993, no-one has been convicted of his killing.